Say goodbye to flaking paint, unsightly cracks and epoxy problems with RaceDeck Garage flooring. RaceDeck is easy to install, easy to maintain, and is backed by a 15 year manufacturer warranty! RaceDeck® is the industry leader in garage flooring, with more modular garage floors manufactured, sold and installed than all of our competitors combined. 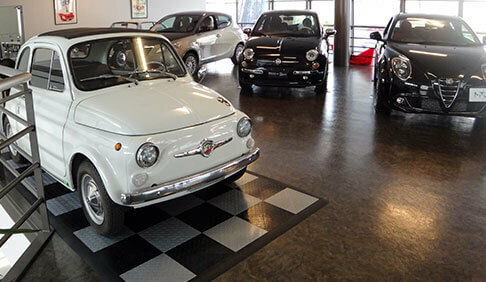 We offer eight different styles of garage flooring tiles, 14 standard colors, and limitless custom color options. RaceDeck Floors are great for garages, basements, porches, patios, and more. Installing RaceDeck requires no glues or chemicals, messes and toxic fumes, each module simply “snaps” into place! 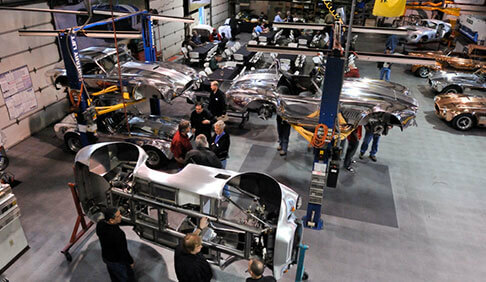 All RaceDeck products are proudly made in the USA. 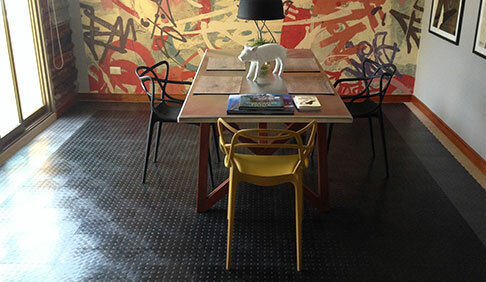 RaceDeck flooring is a free-floating surface you can use virtually anywhere in your home. Whether you rent or own, you can change the look and feel of any room with RaceDeck. 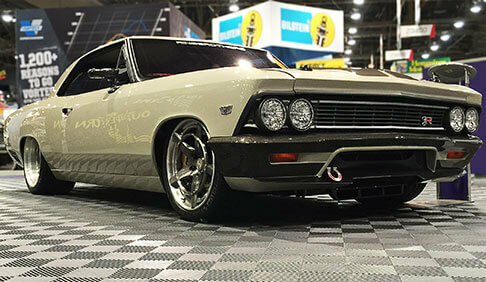 RaceDeck Commercial Garage Floors, can be found everywhere, from your local speed shops and dealerships to the most famous hotrod and builder garages on TV. Over 30 years of technology have gone into RaceDeck’s multi-patented garage flooring system, and all RaceDeck products are proudly made in the USA. RaceDeck flooring provides a clean, professional and unique look that will set your commercial space apart from the competition and show them you mean business. RaceDeck floors are resistant to petroleum and household chemicals, and with dozens of styles and colors to choose from, your floor will always “wow” your customers. 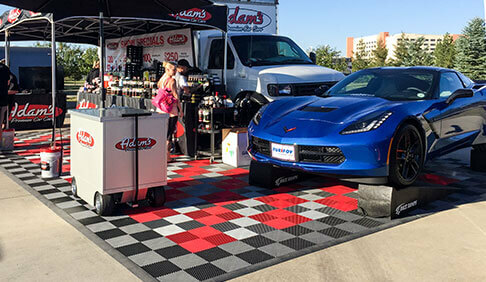 Customize your trade show display using RaceDeck flooring in dozens of style and color combinations. RaceDeck installs quickly and easily, no experience and no tools necessary, plus RaceDeck tiles are small and lightweight making transport to your next show a “snap”. 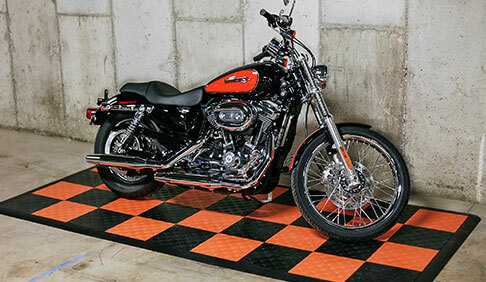 Use RaceDeck flooring to create a custom showcase pad for your motorcycle, in any one of our many color and style combinations. 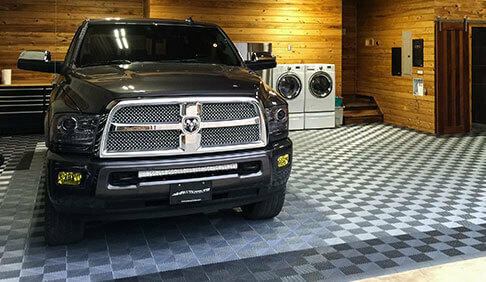 Cover your showroom with RaceDeck flooring to create an eye-catching point of purchase display or use in individually designed pads. RaceDeck flooring is lightweight, installs in minutes, and can be moved easily by simply unsnapping! RaceDeck floors are perfect for mobile displays that need to be set up and torn down quickly, inside or out. Give your mobile display a professional and polished look, while keeping products, vehicles and customers off the ground and away from the elements. 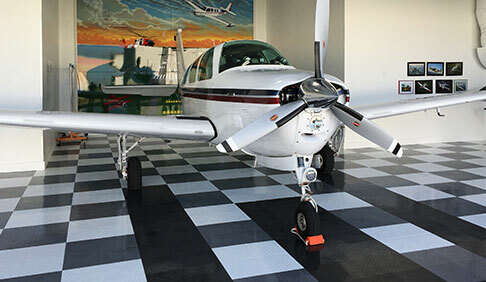 Propel your hangar floor from ordinary to extraordinary in just a few hours, with RaceDeck flooring. Get rid of unsightly blemishes, stains, cracks and peeling paint, with no preparation required.